Suppose you’re digging in the back of the fridge, and you come across forgotten pints of strawberries. You look in the package and see that one or two of them have seen better days. Instead of chucking the whole lot of the them or heating up a summer kitchen baking a pie, consider using the perfectly good strawberries to make cool and refreshing Agua Fresca! First, we macerate. Put strawberries, sugar, and the 1/2 cup of water in a mixing bowl. 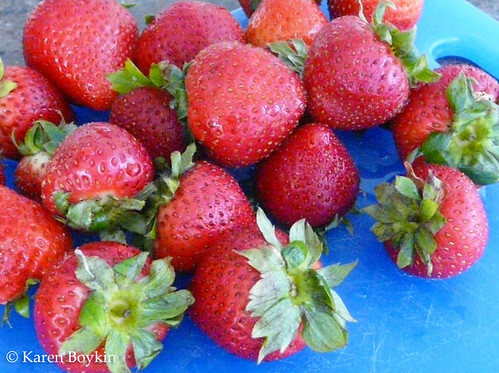 Mash the strawberries with a fork or potato masher, mixing well with the water and sugar. Either cover the bowl with plastic wrap or transfer the mixture to another covered container. Refrigerate the berries for 3 to 4 hours, giving the sugar time to soften the fruit. Remove the mixture from the fridge and pour into the blender, along with the lime juice. Pulse the sugared fruit and juice for about 30 seconds until it resembles a slurry. Pour the well-blended mixture through a fine mesh strainer to remove seeds and pulp. You may either discard the seeds and pulp or do what I did: use a spatula to scrape these usable leftovers into plain yogurt. Voila! No waste except for the hulls. Place the remaining liquid into a pitcher, carefully adding the carbonated water. If you want to make this an adult beverage, consider stirring in 3 shots of top shelf tequila or vodka to the pitcher before adding the carbonated water. Chill your agua fresca for a bit or pour it over cubed or shaved ice. Garnish with a twist of lime. Enjoy! By the way, you can use this same recipe with cantaloupe, watermelon, cucumber, papaya or pineapple; almost any seasonal fruit will do. 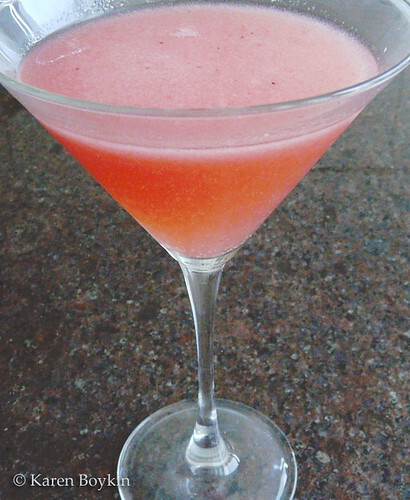 Let me know how you make your own Aqua Fresca! Looks delicious and refreshing! Love the color.